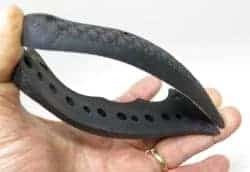 Like many who have their head on a survival swivel, you may have noticed a monster blade by the Schrade Knife Company that seemed too good to be true. Its huge cross section, full tang, combination serrated/reverse curve blade, and black tactical skin make it seem a no-brainer for the scant $30-$40 it sells for in sporting goods stores and gas stations nationwide. Well, unfortunately it is too good to be true, but its not without a purpose. As a Get-Home blade, the Schrade excels, but for a Bug Out knife, forget it. Let me explain. The Schrade SCHF9 Survival Knife is an impressive slab of sharpened 1095 carbon steel that sure looks like a great knife. It’s specs in a nutshell are a foot and a pound. But looks can be deceiving. First of all, the steel is marginal at best, and wildly substandard if you have any experience and expectations of finer irons. In fact, this particular version of 1095 is troublesome steel when it comes to edge sharpness, edge retention, sharpening, corrosion resistance, and just about everything else but price. However, for short-term use, the Schrade SCHF9 Survival Knife has advantages. For one, the cost. Second, you can beat the hell of it without concern of losing your investment. Third, the sheer mass of the of the knife will demand fear and respect from every snowflake for miles around. And that’s about it. 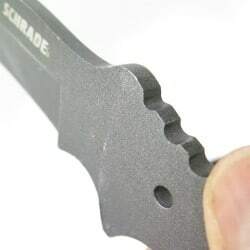 Poking holes in the Taiwan-made Schrade SCHF9 Survival Knife facade is easy. But picking your starting point is hard. There is the blade shape, the steel, the edge grind, the handle, the tang, the sheath, and the coating, just to name a few launch points. The blade shape is a drop point with reverse curve. Unfortunately a drop point of this size is somewhat contradictory. The drop point was designed to help keep the tip of a blade from catching on things or the unwanted tearing of flesh and entrails during intricate gutting tasks. But on a blade big, those finer movements are tough in spite of the blade shape. And worse, the drop point is not the best fighting blade due to its subdued point, yet a cutter as large as the Schrade SCHF9 Survival Knife should have both offensive and defensive potential. The reverse curve of the blade is shaped to keep the work-piece in place during cutting. Say for instance you are slicing something back and forth. As you press the blade into the work-piece there is a chance the knife could slip forward off the task. The reverse curve creates an uphill battle causing a more likely re-centering of the work-piece rather than sliding off it. While the reverse curve is common on knives from pocket to machete, it does limit the jobs that a survival knife should excel at. But chopping brush and hacking through branches is truly easier with a reverse curve. It’s just that reverse curve blade chopping chores are not front and center in most survival situations. 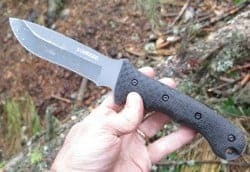 The steel of the Schrade SCHF9 Survival Knife is a room-temperature working steel that has neither the desirable properties of a survival knife or a hatchet. The steel does not hold an edge well regardless of the quality of its temper, it does not sharpen easily, and it is prone to chipping and rollover compared to 21st century knife steels. Even worse, the rust-prone nature of a carbon steel is often armored against corrosion by a blade coating. Unfortunately the black paint on the Schrade SCHF9 Survival Knife blade flakes off easily, and scratches even easier. Experience with high quality blade coatings has proven that durability is possible. But that is not the case here. But for $30 what should we expect? To make opinions about a knife, or anything for that matter, relevant, there should be comparable(s) in the mix. Any single knife cannot be compared to itself, only other blades. So for this review, my comparable(s) were the Ka-Bar BK-2 (at twice the price of the Schrade), the Boker Orca 2 (at six times the price) and the Fallkniven F2 Wilderness Knife (at ten times the price). The Ka-Bar offers a similar blade steel and thickness. The Boker Orca 2 offers a similar blade shape and handle profile. And the Fallkniven F2 offers a similar overall length and weight. 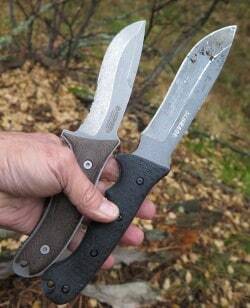 Personally, I would take any of the above over the Schrade SCHF9 Survival Knife, but in the short-term Get Home, there is little chance that unless traveling long distance across varied terrain, the major difference between the blades will rear its ugly head. The handle of the Schrade SCHF9 Survival Knife looks impressive from an arm’s reach, but reality tells a different story. The rubber grips do grip, but will have a shelf life of about one hard Get Home. Technically, the grips are a rubber-like elastomer called Kraton. 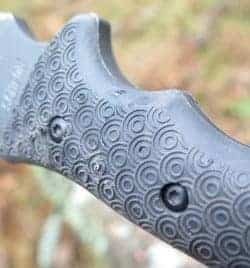 It is a polymer with many desirable properties for knife grips, but the execution of them is severely is knife dependent. Just like the blade. The grips, or scales really, are held onto the knife tang, but not held in place. Even when the four torx-screws are tightened tightly, the grips still slide around. And given that they don’t match the contour of the steel tang, gaps ebb and flow as you use the knife. The combination of screw-mounted rubber grips is rare. Usually the entire handle is contained into a Kraton grip shell molded over the tang, or the grip scales are a more firm material like Micarta or G10, or glass reinforced polymer (aka Plastic). You can actually feel the rubber material of the grips move when twisting and turning the blade. Not so much with gloves on, but certainly enough to know it won’t last under sustained use. And given the blade steel and shape along with the grip, the Schrade SCHF9 Survival Knife may have a place in the immediate, but certainly not in the long term. But there is one more issue, one of concept. The Schrade SCHF9 Survival Knife appears to be a significant chopper and wood processor. 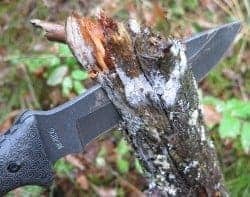 Chewing through wood is a serious issue with SHTF and survival blades. In fact anything that can bash and baton through pine is a friend when things go dark. Although the Schrade SCHF9 Survival Knife does chop, it does so more out of dumb luck than talent. In fact it is a fairly poor chopper compared to other choppers of this size partially due to the blade grind, and also due to the fact that the non-skeletonized metal of the tang places a proportional amount of weight behind your index finger as it does in front of it. So a knife of this weight is much less productive than a equally massive hatchet. 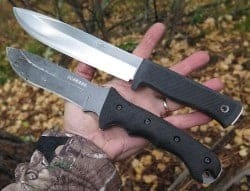 The Fallkniven F2 is dynamite at chopping, while the Schrade SCHF9 Survival Knife is sluggish and subdued. The convex grind on the Fallkniven F2 throws wood far as its blade makes quick work of the wood. 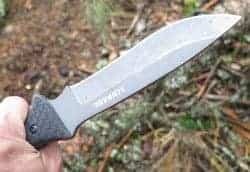 Sadly, the Schrade SCHF9 Survival Knife instead attempts to dive deep into the wood with its flat grind throwing no wood and doing surprisingly little damage given the muscle behind the swing. Worse, the heavy spine tends to spin the blade when angle struck rather than pry out wood chips and throw them across the forest floor. For a knife to remain a knife and not just a chopper, the blade must have a skill set beyond the crude splitting of firewood. Alas, the Schrade SCHF9 Survival Knife is an amateur when it comes to more intricate survival tasks. Which leads to the question of if it should be part of a bug out kit at all. My answer? No. There is so much more to survival than just chopping wood. And the knife is arguably the single most critical piece of hardware in your kit. Just because the Schrade SCHF9 Survival Knife chops wood does not put it anywhere near a good quality hatchet. And the Schrade SCHF9 Survival Knife’s chopping ability does not circumvent its use as a knife, and thus it fails spectacularly as a performance survival knife. Instead, you would be far better off with a decent hatchet and a quality fixed blade knife smaller than the Schrade SCHF9 Survival Knife. The Schrade line of survival/outdoor fixed blade knives looks like a tree of life for beetles. There are dozens of them with minor differences and odd mixes of features. It’s almost as if the Schrade knife designers are throwing all sorts of shapes and grinds at the consumer wall to see what sticks. Frankly, I would like to see far fewer options, but better ones. Having such a diverse product line complicates the refinement process which is essential to develop a performance blade regardless of cost. Looking at the vast landscape of Schrade survival blade choices all but prohibits the necessary attention given to any one design allowing it to evolve into greatness. Instead, sales numbers will likely drive its destiny with bean counters determining its fate. Sadly, a promising design will be killed off rather than enhanced and updated according to public wishes. 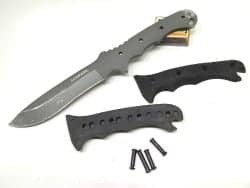 That said, the Schrade SCHF9 Survival Knife can run double duty meaning that if your needs include wood work and wet work, prying, pounding, and penetrating, as well as non-demanding fine knife work, then this Schrade SCHF9 Survival Knife is a solution. One area where a blade of this quality and size comes in handy is working one’s way home after something bad happens. Or working your way to your bug out location. But once there you will need to transition to a knife of higher quality or you just made a tough situation even tougher. Visit Amazon Affiliate Sponsored Links to Support Survival Cache.